1. Using a mortar and pestle or spice grinder, grind the cinnamon and cardamom seeds to a fine powder. 2. In a large pan over medium heat, melt the butter and the sugar until it begins to bubble. Stir in the spices. Add the red wine vinegar, red wine and cider and cook for a couple of minutes. 3. Add the cabbage, onion, apple and sultanas. Make a large circle the diameter of the pan from baking parchment to cover the surface of the cabbage, pierce several times and cook on a low heat for about 1 hour or until tender. Top up with water if necessary to ensure the cabbage does not dry out. 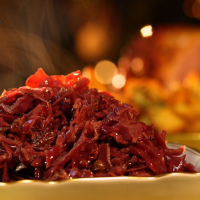 When cooked, remove from the heat, remove the cabbage with a slotted spoon and season to taste.